This position is within the Crisis Response Team for Counselling Services Centre and requires someone with a specialised skillset and relevant completed tertiary qualification who is able to work well under pressure and understand the complex dynamics surrounding sexual assault or abuse. To provide a comprehensive Social Work service to individuals and their families experiencing sexual harm. These include psychosocial assessments and supportive interventions as well as a flexibility to support individuals experiencing trauma within a multi-disciplinary setting. To provide this service in a culturally sensitive and appropriate manner, in accordance with Social Work practice standards, organisational policy and Sexual Violence principles that is underpinned by the principles in the Treaty of Waitangi. The objective of the role is to improve the experience for clients, including family/whanau that has experienced sexual violence by delivering evidence based intervention and assessments. This will improve the overall access and timeliness of access to counselling and social support services. You will need to be registered with the Social Workers Registration Board. For further enquiries please call 09 277 9324. Closing date for applications is May 3rd 2019 at 5pm. This role is for a registered counsellor or social worker to facilitate CSC’s strengths-based, cross-cultural male school based programme supporting young people aged 13 to 17 years who have experienced or witnessed sexual and/or family harm, bullying or have had a traumatic experience. This is delivered in schools across the Counties Manukau area. You will need to have experience working with young people who have experienced trauma. This is an 8 week program in multiple schools. Hours of work would be negotiated by how many schools require this programme. This is a developed program and full training will be given. Relevant qualifications and professional registration in social work, counselling, psychotherapy or similar. Commitment to supporting clients using Te Whare Tapa Wha model of practice. Within your cover letter please summarise your experience of facilitating groups and working with young people who have experienced trauma. For further enquiries please call 09 277 9324. Working for Counselling Services Centre in Papatoetoe, you will be providing support for people in Counties Manukau affected by sexual violence. While based at home until you are called out, you could be working from a variety of different locations, depending on the needs of each individual client. This role is for ACC Sensitive Claims counselling and working with people who have experienced trauma, with a specific focus on clients affected by sexual harm within the Counties Manukau area. We are looking for counsellors, psychotherapists, or psychologists who are already registered with ACC. Hours of work would be at your discretion based on client needs and in your own rooms. You will be a self-employed contractor with CSC as the Supplier and you will be a Provider. Within your cover letter please summarise your experience with supporting people affected by sexual harm. Regardless of whether or not we have any vacancies advertised, please feel free to make contact with us at any time to register your interest in working with Counselling Services Centre. 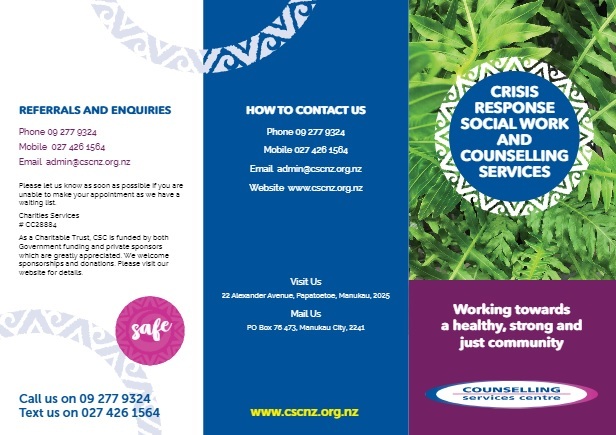 Counselling Services Centre (CSC) is a not for profit agency located in Papatoetoe, South Auckland. We have been providing counselling and practical support to the Counties Manukau community since 1986. 24/7 free and confidential crisis response service for anyone affected by sexual harm which includes assault or abuse. Free and confidential support for people who go through the justice process, during and after trial. Our counselling team accept self-referrals and referrals from other agencies and services. Our counsellors are registered with a professional body such as NZAC and NZCCA, and most are ACC registered. Our social work team provide advocacy, support services and resources. Our social workers are registered with SWRB and ANZASW.